Oftentimes investors will debate whether one stock is superior to another within the same industry sector. In some cases, the answer is not clear cut especially when comparing companies within a somewhat volatile industry. In today’s article I take a look at two major integrated oil and gas behemoths in the energy sector to bring home my point. 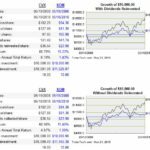 These companies are Chevron Corporation (NYSE: CVX) and Exxon Mobil Corporation (NYSE: XOM). 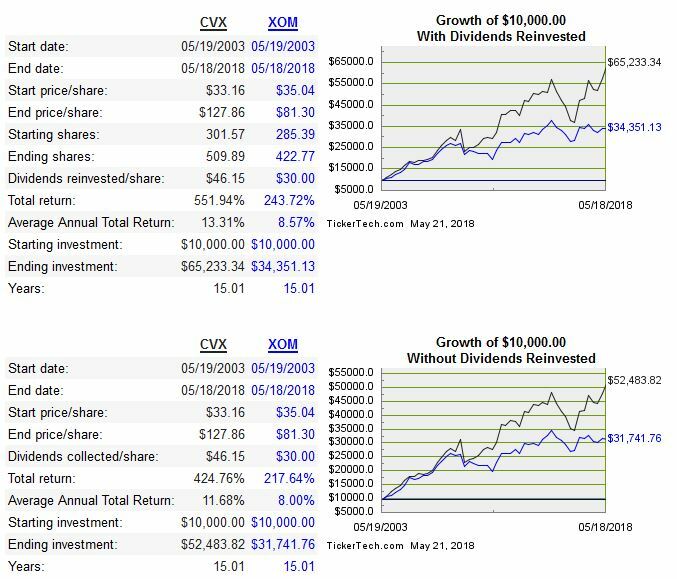 While these companies are similar in some aspects, CVX is a more volatile stock than XOM as borne out by their respective beta levels (CVX: 1.2) and (XOM: 0.81). A beta of less than 1 means that the security is theoretically less volatile than the market and a beta of greater than 1 indicates the security's price is theoretically more volatile than the market. 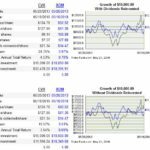 In the case of CVX, we would expect its stock price to be theoretically 20% more volatile than the market while XOM would be 19% less volatile than the market. Given that CVX has a much higher beta than XOM, an investor can expect far greater price fluctuation with CVX. As a result, the period over which these two companies is being analyzed could result in materially different results. Recognizing that results could perhaps vary materially depending upon the timeframe in which the analysis is conducted, I decided to see what would be the outcome of a $10,000 initial investment made in both companies on May 19, 1998; this is the earliest date my data source provides. I then arbitrarily chose 5, 10, 15, and 20 years timeframes for which I looked at returns with and without dividend reinvestment. While I have included a comparison over a 5 year timeframe for this article’s purposes, I do not view 5 years as a long-term investment time horizon; a holding period of 10+ years or more is what I deem to be long-term. I am merely including the 5 year time horizon for illustrative purposes. 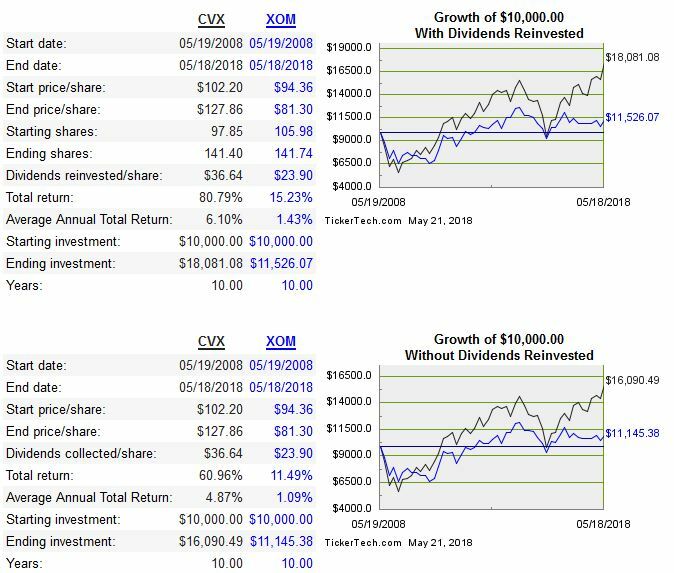 In all instances, CVX generated superior returns to those generated by XOM regardless of whether dividends were reinvested or not. The longer the timeframe analyzed, the greater the variance in the average annual total return. The variance in the appreciation in CVX’s value relative to that of XOM was less over the 20 year timeframe than the 15 year timeframe which supports my notion that results can differ depending on the time horizon selected for analysis purposes. 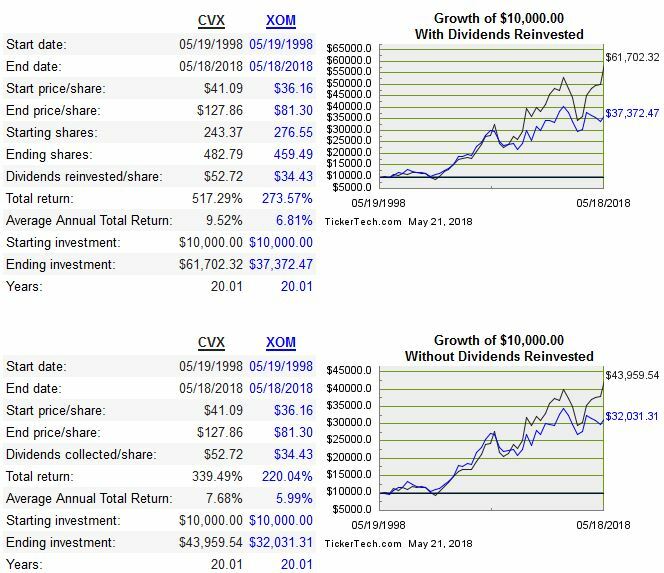 Looking at the charts reflected above, CVX and XOM shareholders have generated superior total returns in the scenario where dividends were automatically reinvested. 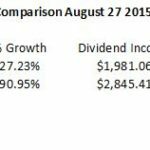 This is as I expected and reinforces my strategy to automatically reinvest dividends. Less interference on my part means there is less likelihood of me messing up. 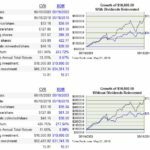 I have purchased shares in CVX and XOM at various times over a number of years and, three years ago, when I tried to determine which stock had outperformed the other I found it too time consuming to try to accurately determine the results. That is why I decided to conduct an 'experiment' in which I acquired 300 shares of each company on August 27, 2015. While I should have bought the exact same dollar value to make my 'experiment' more accurate I really wanted to make my 2 purchases in full blocks. I also figure that the $1,053 variance between the two purchases was immaterial. Here we are, slightly less than 3 years later. Sure, 3 years is certainly insufficient time to properly assess which is the preferred investment from a long-term wealth creation perspective. Nevertheless, it is interesting to periodically compare results so let's see how things have panned out so far. 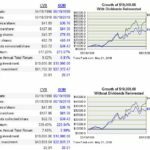 If we look at the results of these purchases we see that the overall return of CVX far exceeds that of XOM by a wide margin in less than 3 years; the following data reflects the actual results of my two investments. 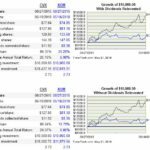 The data from the same source used to ascertain investment returns over the historical 5, 10, 15, and 20 year timeframes supports my personal investment experience in this experiment. The greater appreciation in CVX’s market value does not surprise me because of the different beta levels to which I referenced at the beginning of this article. I am also not naïve to think that CVX’s stock price will not experience a greater pullback than that of XOM next time energy prices pullback. 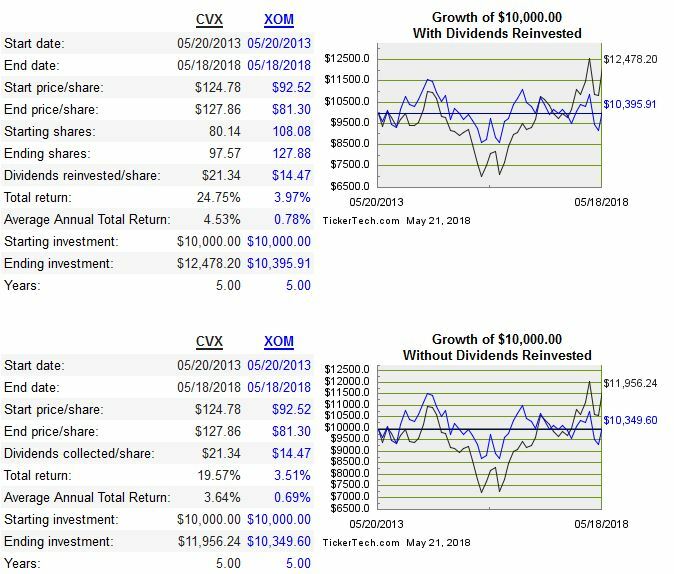 Interestingly, the dividend income derived from CVX during this short timeframe is ~$846 greater than the XOM dividend income even though CVX held its quarterly dividend constant for 10 consecutive quarters at $1.07 (Q2 2014 – Q3 2016). 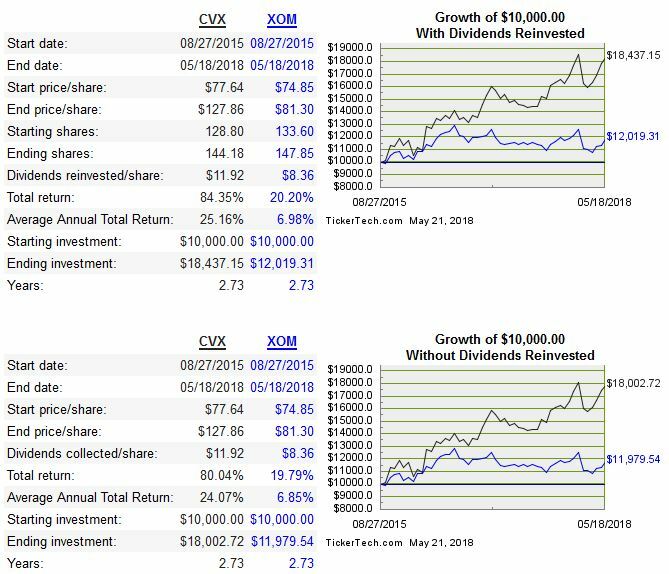 CVX’s dividend history can be accessed here and that for XOM can be accessed here and here. I am also encouraged that CVX's management has indicated there is a possibility share buybacks will resume at some juncture and that dividend growth is a top priority. Regrettably, my wife and I have no contribution room remaining in our tax advantaged accounts (Registered Retirement Savings Plans). 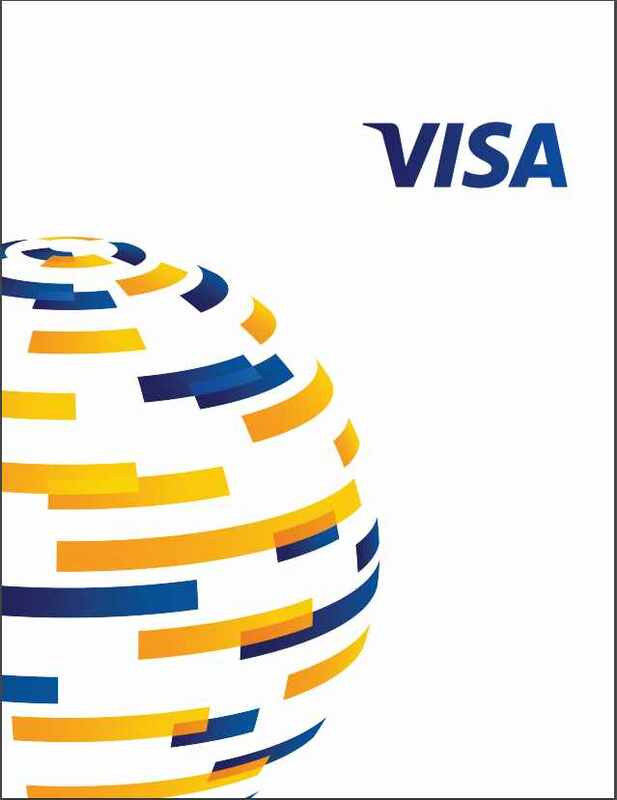 I, therefore, had to purchase the CVX and XOM shares through a non-registered account which means all dividend income will incur a 15% withholding tax. Coincidentally, both investments were made almost at the exact time the CVX and XOM stock prices were at their lowest level in the past several years. If only my timing was equally as good with all my other investments! Based on periodic reviews of the results of both companies during the past 3 years I have been increasing my exposure to CVX to a greater extent than that in XOM. At this stage, however, I am comfortable with my exposure to both companies and am unlikely to acquire any additional shares (with the exception of the shares acquired through dividend reinvestment) until such time as their stock prices experience another major pullback. 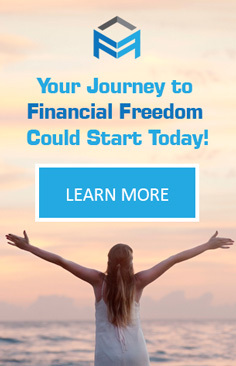 When I do eventually acquire additional shares, my intent is to refrain from co-mingling any new funds with those used in this 'experiment' so as not to distort any results. Any new additions will be added to the holdings for which I do not disclose details. Disclosure: I am long XOM and CVX.